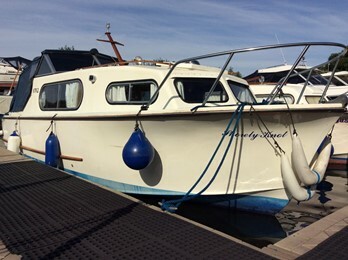 Freman 23s are a classic river cruiser. This example is presented in tidy order. 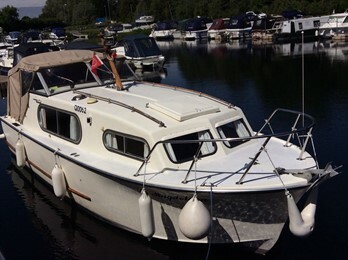 A tidy example of the Freeman 23 river boat which benefits from a new canopy. 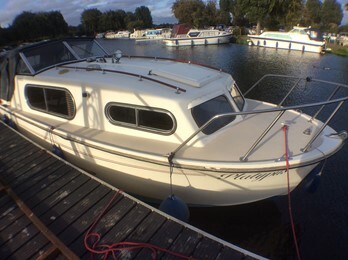 A tidy example of the Freeman 23 river boat with hot water and recently replaced window seals. 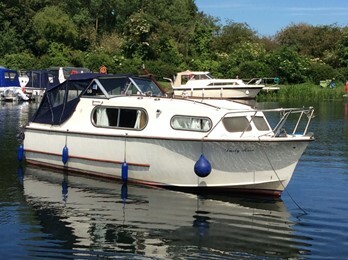 This is a very well presented example of this popular classic river cruiser. The shallow V hull together with conventional shaft drive and long keel makes he boat a delight to handle. The foam core GRP construction leads to a cosy, well insulated interior. The Freeman 23 is essentially a stretched version of the earlier Freeman 22.This model had a level superstruture and side deck. John Freeman built approx 700 examples. Top speed approx 7 knots. Freemans were famed for their excellent timber interior and the quality is still evident in these craft today. Accommodation is a classic 4 berth layout with 2 V berths to the bow and a table dinette that folds down to form a double berth. There is separate toilet compartment and galley area. The most popular engines fitted were the Ford Watermota Petrol (35hp) and Perkins 4.107/08 diesel (45hp). The Freeman is cheap to run and mechanically reliable with good spares availability.